Does the onset of those cold, dark winter mornings mean a little bit more to you than others? Suffering from SAD (seasonal effective disorder) is a depression which is triggered by changes in the seasons. The good news is that you no longer have to put up with those feelings because there is a solution – the Davita Light Box VITAbright 100. 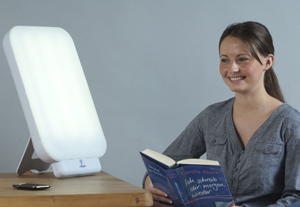 Light therapy is a highly regarded treatment for SAD and the VITAbright 100 mimics natural outdoor light. This exposure to light stimulates chemicals in the brain such as serotonin which are linked to your mood and ‘happy’ feeling. Using the light box for only 1 hour a day can dramatically improve your mood and lift your spirits. While a light therapy box is hugely associated with SAD, the fact that it triggers this chemical change in the body has proven light therapy to be a successful solution to other forms of depression, sleep deficiencies and even jet-lag. The impressive surface area of the VITAbright 100 from Davita means you can enjoy its benefits with others too; so after that long haul flight both you and your partner can recover together. For optimum results, use the lamp each morning for 5-10 days in a row and you will begin to notice big differences. The Davita Light Box VITAbright 100 is very powerful emitting up to 10,000 lux at only 30 cm distance. You don’t have to stare directly into the light continuously for it to work so take some ‘you time’ and enjoy watching the TV, listening to music, reading a book or indulge in hobbies. We know life can be exhausting; take time-out to revitalise with the VITAbright 100 light therapy box from Davita.